What is a Teddy Bear Goldendoodle? a) It is Simple....a goldendoodle that looks like a teddy bear. ;o) Actually it is an English cream Golden and a poodle mix. Some of ours will only be 97% golden (slightly smaller than a pure golden because we use a miniature golden mom) Most of our Litters will be 50/50 Golden retriever X Standard Poodle. How big does a Teddy Bear Golden Get? a) Likely between 45-65 lbs at maturity depending upon the mating. 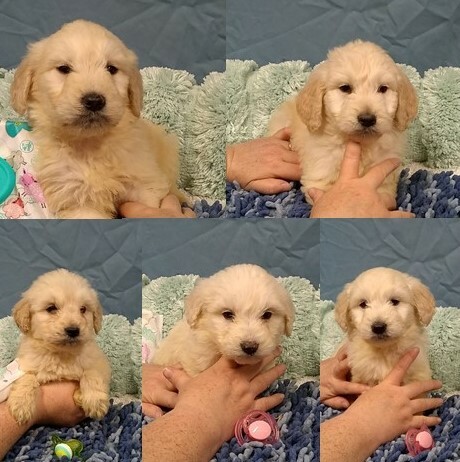 What is the temperament like of a teddy bear goldendoodle? a) Just like a Teddy Bear. Soft, mellow, .... gentle and SO cuddly! Are they a pure bred dog? a) No. This is a golden retriever poodle mix. a) Not at this time. Goldendoodles are a mix not a pure bred dog. Do you require a spay and neuter contract? a) Yes, we require all of our puppies to be spayed and neutered. PLEASE SEE OUR "START HERE" PAGE to get some of your questions answered. They will likely lighten up in color.